In much of the world, women continue to be engaged in their traditional roles as mothers and family caregivers. 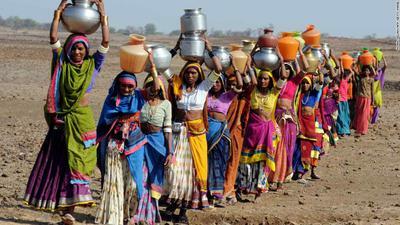 Climate change impacts women in many ways. Childbearing makes women more vulnerable than men. Women and young girls often spend large parts of their day in the pursuit of fresh drinking water and diminishing food supplies. The following is a laser talk featured on the Citizens Climate Lobby website. It’s reproduced in BoomerWarrior with permission. Water stress and shortages will lead to an increase in women’s labor in many contexts as they have the primary responsibility of collecting water in many parts of the world (Mearns & Norton, 2010). About 2/3 of the female labor force in developing countries and 90% in many African countries are engaged in agricultural work. In the context of climate change, traditional food sources become more unpredictable and scarce. As well, women face a loss of income as well as harvests. Gender differences in death rates attributable to natural disasters have been linked directly to women’s economic and social rights (Neumayer and Plümper 2007). Women are more vulnerable to death in extreme weather events; women typically outnumber men by 14 to 1 among those dying from natural disasters (Araujo et al. 2007, p. 1). For example, social prejudices keep women and girls from learning to swim, and as a result, they are more vulnerable to flooding disasters (Oxfam, 2005). In an April 2015 poll of Canadian women, 74% of women believe that protecting the climate is more important than building the Energy East pipeline and further developing the oil sands (Climate Action Network Canada, 2015). This is good news for our sisters in the global south because Canada could help women around the world by pricing carbon pollution at the national level, spurring other nations to do the same and thus helping to mitigate the impacts of climate change on women.